Last year I had the occasion to meet and photograph the Italian whirlwind that is Fabbio Picchi. Picchi is the mastermind behindCibreo, Trattoria Cibreo, Cafe Cibreo and Cibreo Teatro del Sale, all located in the Sant'Ambrogio neigborhood of Florence, quite near the Mercato di Sant' Ambrogio. The trio of restaurants are just doors apart, creating a little gastronomic empire. All the restaurants are worth a visit but the most interesting is Teatro del Sale, the private dinner club and theatre. Teatro del Sale is a members-only restaurant/theater/club housed in a former convento. Patrons are required to become a member for a minimal one time fee and then are treated to an interesting spectacle of food and theatre. The theatre part comes after dinner when the room is transformed and all chairs are pointed towards the stage. The entertainment, which is organized by artistic director Maria Cassi, a famous Florentine actress (and Picchi's wife), can range anywhere from comedy, to a lecture on Bob Dylan's Music to the 1970's children's film, Pete's Dragon. It is ever changing and completely fascinating. Picchi and his staff in an open glass windowed kitchen, are somewhat of a show themselves as guest sit at long communal tables eagerly awaiting his food. In the kitchen they whirl around one another seamlessly preparing the evening's unique menu until suddenly and without warning Picchi charges out of the glass windowed kitchen and announces with great gusto and force whatever the primo piatti may be! Guests then rush the buffet table . After several courses and dessert, at 9:30 or so, the room is cleared for the theatre portion of the evening. Once you have become a member, you are part of the club for life barring that you don't lose your membership card which entitles you to private breakfast lunch or dinner at Teatro del Sale. You may feel free to stop by during the day to have a coffee or a pastry or lunch and to sit in the many comfortable chairs and just relax or eat. The shop is open to the public but you must be a member to partake in breakfast, lunch, or dinner. While at Circolo, pick up one chef's shirts or pants or handsome silk ties designed Picchi himself. There are also beautiful wine glasses from old recycled wine bottles for sale in his emporio/ piccolo store (and they ship!). His shop is full of sea salt and marmalades and pickled vegetables he has made himself! If you go to Caffe Cibreo in the morning after the market, do not miss the ciambella, an italian donut. There was a warm and enticing pile of them sprinkled with sugar when we were there. They are quite delicious. If you want to feel Italian you can order a caffe doppio and cornetto integrale con marmelata. Try to go ahead of time to make a reservation and to join the club. Dinner is quite hectic and quite a draw so you should definitely cover the logistics well in advance! Cibreo was his first restaurant, opened in the early 1980's . 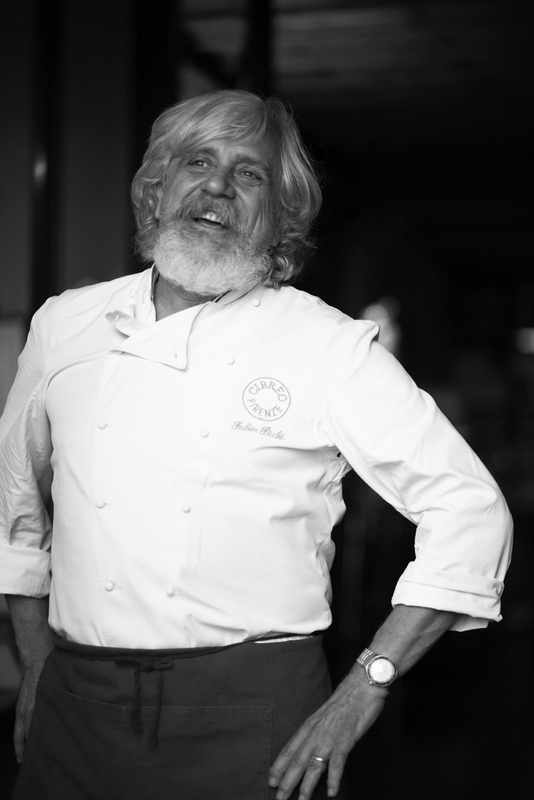 He does a lot of classic Tuscan dishes at Cibreo but no pasta, so be forewarned. If you want pasta go to Trattoria Cibreo, it is less formal and less expensive. Don't miss the neighborhood hardware store in the square, it sells everything but the kitchen sink!